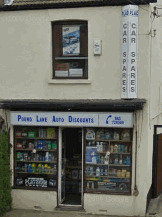 Looking For A Bradwell Car Spares Shop? If you live in or around Bradwell in Essex, and you are on the lookout for low cost (or as cheap as we can make them) car parts, then you have come to the right place. Pound Lane Auto Discounts are the number one car spares shop in Essex, and are extremely proud to still be in the business 30 years after first opening our doors. From brake pads and shoes, to spark plugs and ignition parts, to car accessories and cleaning stuff, to whole exhaust systems and body parts, if you want it then there is a very good chance that we have it in stock. And it doesn’t matter if it is Ford Parts, Vauxhall spares, Kia items, Jaguar, or even some obscure import from America or the continent. So if we haven’t got the car parts you want, or can’t get it ourselves, we can normally tell you where to go to find it. And that is why we have been dominating the car spares shops in Bradwell and Essex, for so long, even though we still have people popping in to tell us. So we would be extremely grateful to be able to supply car parts and spares to you and your family, to keep your Bradwell motors running for another 30 years or so. So no you will have to make a quick journey from your Bradwell home. But remember if you order online as we mentioned at the top of the page then you will never have a wasted journey again. Shoot across from Bradwell for the perfect "Click and Collect" parts ordering in the whole of Essex. There is a link at the bottom of the image which will take you to Google Maps, so just enter your Bradwell postcode in the field for directions that you can print up. And that desire to take the unwanted effort out of your driving and motoring experiences is why the town of Bradwell, have the perfect car spares accessories shop right on their doorstep. Ok not quite on their doorstep, but still come on.....give us a try. Drive along the A130 until you arrive at a large roundabout known locally as the Sadlers Farm roundabout. There is a layby which can be parked in, or roadside parking is plentiful. If you decide that once you get close to us you want to turn onto the A127, you will need to head towards London. It won't take long, and then you will find yourself passing a large garden centre on the left hand side called "Altons" . Just after this garden centre, there is a sudden left hand turn. Take this, which is Pound Lane, and continue on this for about one mile. On the left hand side you will find Pound Lane Auto Discounts. If you find yourself driving through a chicane in the middle of the road you have gone too far.